We've been trying out Apple iPads in Bookassist and have a few observations to make. The device mostly lives up to the hype as a great portable communication tool. It is clearly aimed at the "consumer" end of media rather than the creator end, in that it is great at browsing the web, dealing with email, watching videos and films, listening to music, looking at photographs. If your country has the iTunes Movie store, it's easy to get movies onto the device via iTunes syncing, and the quality of movie-watching experience is really superb. During a recent 9 hour transatlantic flight between USA and Ireland offices, I watched 2 full movies, the remaining half of a third movie, and for an hour or so did a bit of word processing on the iWork Pages app while listening to music on the iPod app. All told, something in the region of 6 to 6.5 hours of use, with Wifi off. The battery went from 100% to 57% for all of this usage, which is seriously impressive. It definitely gets the thumbs up on battery. Web experience is great, when connected to Wifi of course. Bookassist booking engine runs really well in standard web mode, as you find it on hotel websites. But we've adjusted the mobile booking engine version also (shown here) to run really well on iPad and to give a more naturally "touch" experience on the large screen. This will be released shortly as an update to the mobile webapp. 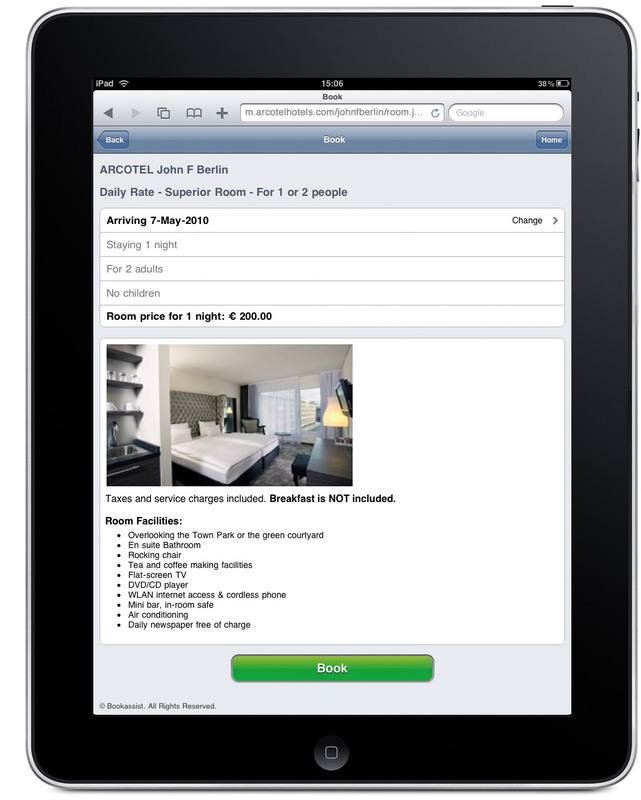 We suspect that hotels will want to make sure that iPad users get this experience also rather than the standard web experience for iPad users, good and all as that is. You can use a third party app such as Dropbox to keep documents in sync between your desktop/laptop and your iPad if you want to be able to readily access working documents while on the go. On the downside, Apple's iWork applications for iPad - Pages for word processing, Keynote for presentations and Numbers for spreadsheets - proved to be a slight disappointment. At Bookassist we use iWork applications on the desktop extensively. The indications were that moving files to iWork on iPad would be relatively seamless. Not so. Apple really should not have called the iPad iWork apps "Pages, Keynote, Numbers". A modifier such as "Pages Lite" or "Pages Mobile" would have been far better to indicate their reduced capabilities in some areas. iPad Pages and Numbers work well. The on-screen keyboard input takes relatively little to get used to and if you are familiar with the desktop apps you are up and running with these without too much difficulty. They are great for taking notes or doing quick work on the go. The use of the touch interface is quite intuitive if you are used to the inspector in the desktop versions. iPad Pages lacks the "Track Changes while Editing" feature that I would use quite a lot when reading others' documents. While you can create decent documents on the go, editing other's documents is not as elegant. Also, opening existing documents from your desktop will likely lead to some formating changes which is annoying. It is a great app, but it is not the same as the desktop version. iPad Keynote looked like it could really substitute for the laptop when giving presentations. Alas, that was a firm no for me. None of my desktop presentations, transferred to iPad, would import into Keynote. The cause is probably the extensive use of animations and element grouping that I make, or customised templates. Generating a simpler Keynote presentation meant the import worked fine, and generating a presentation directly on the iPad was a breeze. But the cool 3D graphics in charts are reduced down to 2D and some builds are not present. They still look great, but they are not what you might have come to expect of Keynote. Again, considering the device, this is an amazing app, but the expectation based on the desktop experience of the full app was higher. A real show-stopper is the output to VGA for Keynote on the iPad as currently implemented. While the iPad displays your presentation as expected, there is as yet no remote control option to progress slides, requiring you to physically tap or swipe the iPad for each slide progression. As a speaker, I hate being stuck at the podium and prefer to be out and about on the floor while talking, so this lack of functionality is a real issue. Having to return to the podium for each change makes a real break in delivery momentum that is unacceptable. Sadly, the feature I anticipated most is a non-runner for now. Apple needs to fix this bigtime. Also, there is no option to add and view notes per slide, no presenter view. This will likely be an issue for some users. Make no mistake, the software engineering to get iWork running on the iPad is a really fantastic feat that Apple deserves credit for. But for Apple marketing to give the impression that these apps are up to exactly the same desktop standard is a mistake since it will only result in disappointment among users. In summary, what the iPad does, and what it was designed for, it does exceptionally well. It is fantastic for web, mail and media interaction, just as advertised. Its interface is very intuitive. What it does not do well, and what it was not designed for, is to facilitate content creation at desktop standards. In that regard it is not yet a substitute for a full-fledged laptop while traveling. Apple have posted a document to help with importing Keynote slideshows, and this has resolved many of the initial issues I had. However it does mean simplifying your presentation.